weight at most car shows when it comes to placing in the top group for the best-looking engine bay? [:I] Those of you who have entered your car in some shows or just attend shows to see some nice rides and get ideas on what you may want to do to modify your Cruiser what are your thoughts? I would appreciate hearing your thoughts. Hey, CREWZIN and turbomangt, since you are experts, what do you think? All my shows go for cleanliness and the only way I can keep up is to keep cleaning the engine bay a few times a week. Sometimes it only takes 10 minutes, other times 1/2 hour. I use the reverse air flow of a shop vac which blows a force of air out while I clean everything with an assortment of brushes to get into the tiniest of spots. I go over every inch of the underhood, engine and every nook and cranny that dust and dirt can accumulate. I also spray everything that's black with a detail spray that I buy from a truck that delivers clening materials to the detail shops. The spray makes everything black look like new. of some sort done for some of your vette parts? Yep, took the whole top of the engine off plus the valve covers and had them silver powder coated. Got tired of painting them. You are pretty much right. Parking lot shows / fun shows are all clean and shine. The most chrome, wire loom, colored hoses and clean as a whistle will win. 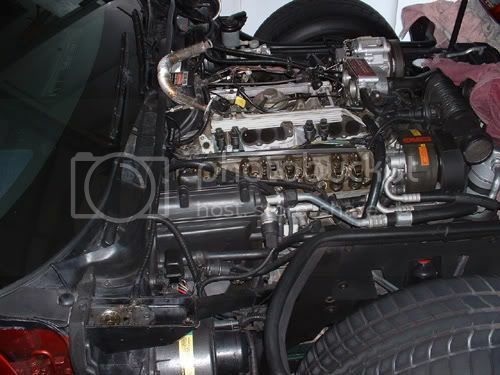 That is what engine compartment is judged in. 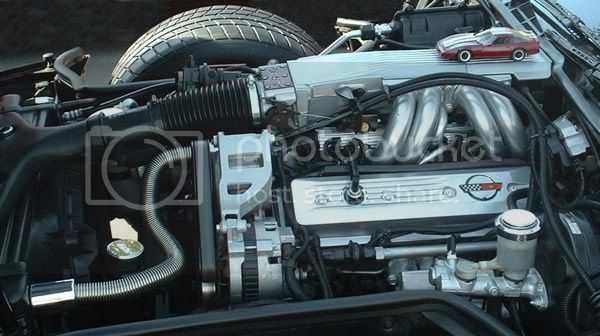 The engine mods (NOS-Super charger-turbo..) add to your overall points not really engine bay. Big shows- Nopi-Lowrider-Hot import nights. These things all matter together you can get anywhere without the whole pkg. Clean will always be supreme. P.S. the chrome of the hood lack-good. Sticks under hood-bad. STICKS[:I] Who's got sticks??? I sure don't and I know Gary doesn't....do you mean Basset Hound? If you do, that's not a stick...that's a BIG BONE to go along with his Basset Hound theme. I agree with the underhood area, as well as everything else, needing to be clean.